Intel Xeon E3-1225 v6, 3.3GHz/ 1x8 GB RAM / 1x 2TB Enterprise SATA 3.5" 7.2 KRPM SATA. 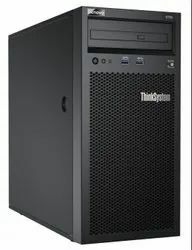 / upto 4x3.5" +1x2.5" bay/ RAID 0,1,5,10 (RAID 121i) Intel AMT / Power Supply Standard (Inbuilt)1 - 250W/ 3 Years Onsite. Intel Xeon E3-1220 v6, 3.3GHz/ 1x8 GB RAM/ 1x 1TB Enterprise SATA 3.5" Hotswap SATA. / RAID 0,1,5,10 (RAID 121i) TS System Manager / Lenovo XClarity Administrator / Power Supply Standard (Inbuilt)1 - 450W / 3 Years Onsite. 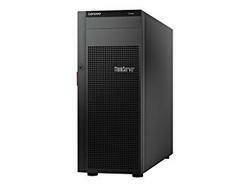 Increased Performance The Lenovo ThinkServer RS160 is an excellent entry-server for growing businesses. Featuring powerful Intel® processors and enterprise-class storage and networking, it offers up to 12Gbps data transfer rate as well as 2x the memory and 60 percent more internal storage capacity than its predecessor. The RS160 is ideal for web hosting, mail serving, file-and-print serving, video streaming, as well as a wide range of general-purpose productivity applications. Intel Xeon Gold 6130 (16 Core) 2.1GHz /16 GB RAM/Open Bay - 2.5 " Hot Swap SAS/ SATA / 930-8i Controller+ 2Gb Flash / X Clarity Controller Std /XClarity Administrator+ 2x 750 W RPS / 3Yr 24x7 4Hr Response + KYD. Intel Xeon Silver 4114 (Deca Core),2.2GHz /16 GB RAM /Open Bay - 2.5 " Hot Swap SAS/ SATA / 930-8i Controller+ 2Gb Flash /X Clarity Controller Std /XClarity Administrator+ 2x 750 W RPS / 3Yr 24x7 4Hr Response + KYD. Intel Xeon Silver 4116 (12 Core) 2.1GHz /16 GB RAM /Open Bay - 2.5 " Hot Swap SAS/ SATA / 930-8i Controller+ 2Gb Flash /X Clarity Controller Std /XClarity Administrator+ 2x 750 W RPS / 3Yr 24x7 4Hr Response + KYD.